Run faster further. Get fitter, leaner and stronger with adidas Train & Run. Track and analyze your runs, get access to hundreds of free training plans, built by adidas’ elite coaches, to help you lose weight, shape and tone, build strength and improve your flexibility. The free training plans will help you learn to run, or prepare to race from 5km to a full marathon. Turn your phone into your personal training coach. The app uses GPS & real-time voice coaching to pace you through your exercise regardless whether you are indoors or outdoors. Analyze and manage your training directly from your phone and get better with every run you make. adidas Train & Run on Windows Phone 8.1 also fully supports FIT SMART! 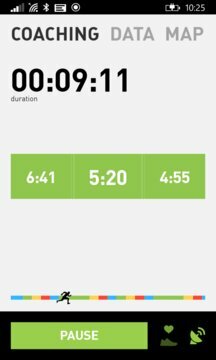 - Track your workouts: the app measures distance, pace/speed, calories burned and elapsed time. - Heart-rate/stride-rate: support of Bluetooth Smart HRM & Stride Sensor (miCoach SPEED_CELL Bluetooth Smart) on selected Nokia phones (check nokia.com). Heart-rate can be used for premium voice coaching as well as simply for tracking. - Premium voice coaching by selected adidas athletes and highly customizable audible alerts. - Get daily planned workouts & coaching feedback delivered to your phone. - Easy access to your music during your activity and deep integration of Nokia Music for all Nokia users. - Track your progress and reach your goals: access your latest achievements and major milestones. - Get stronger: access to more than 400 strength & flexibility exercises and practice by instructional videos (also in landscape format). - Gear Section: track your shoe usage. 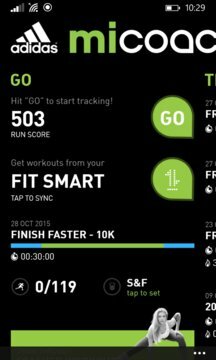 - Sync to miCoach.com to save and view detailed analysis of your workouts. - Share your runs to any social network connected like Facebook, twitter, micoach.com or simply via email. - "pin" your favourite workouts to your home screen for fast access. - Schedule runs directly from the app to the phone's calendar.